cPCI-6930 has scheduled to be EOL. 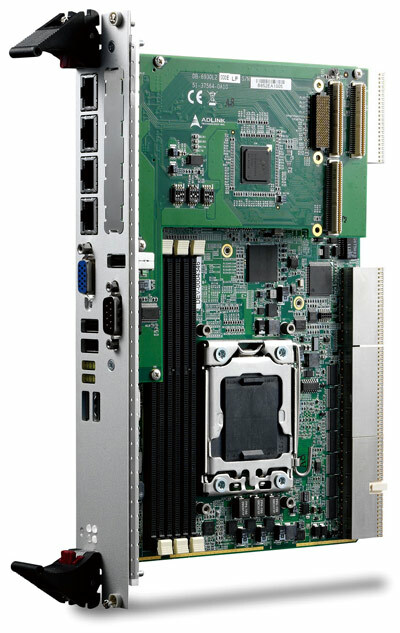 The cPCI-6930 Series is a 6U CompactPCI single board computer in single/dual-slot (4/8HP) width form factor featuring a single 22nm IntelR XeonR Processor E5-2400 v2 with 10/8/6/4-cores in LGA1356 socket mated with the IntelR C604 Series Platform Controller Hub. The cPCI-6930 Series supports three channels of DDR3-1600 ECC registered SDRAM in three RDIMMs slots up to maximum of 192GB, making it ideal for virtualization applications. Graphics is provided by a Silicon Motion SM750 2D GPU supporting up to 1920x1440 resolution. Four front panel 10/100/1000BASE-T ports are provided by the IntelR 82580EB Gigabit Ethernet Controller. The single slot 4HP cPCI-6930 supports four GbE ports, one VGA port, two USB 2.0 ports, and one USB 3.0 ports. The dual slot 8HP cPCI-6930D provides four GbE ports, one VGA port, three USB 2.0 ports, two USB 3.0 ports, one DB-9 RS-232 serial port and one 32/64-bit 133MHz PMC or PCIe x8 XMC site on the front panel. Onboard storage includes 4GB of soldered SATA NAND flash and a SATA 6Gb/s direct connector for an onboard 2.5" drive or CFast adapter. A CompactFlash adapter is available and an onboard 2.5" SAS drive can be supported by BOM option. A selection of optional Rear Transition Modules (RTM) provides additional I/O functionality including two GbE ports, USB 2.0 ports, PS/2 keyboard/mouse port, serial ports, High Definition Audio, SATA ports, additional VGA/DVI interfaces (dependent on selected RTM), and optional CF or SD slot. Up to eight SAS ports supporting hardware RAID via two mini-SAS x4 connectors are available when mated with the cPCI-R6200 RTM, and signals for two SAS ports are available on J5 by BOM option. For dense computing requirements, the cPCI-6930 supports operation in both system slots and peripheral slots as a standalone blade. The cPCI-6930 is compliant with the PICMG 2.9 specification and supports system management functions based on the Intelligent Platform Management Interface (IPMI) as well as hardware monitoring of physical characteristics such as CPU and system temperature, DC voltages and power status. The powerful computing capabilities of the cPCI-6930D Series make it the best choice for virtualization applications based on the compact and rugged CompactPCI specification.